Nothing says relaxation like a massage. Oh wow! If you have never experienced a massage - now is the time to give yourself a gift of relaxation. A massage is relaxation for the mind and the body. And it is always best if you can have a massage by someone that is recommended to you. And we want to recommend Deborah from Healing Hands. Deborah has pampered our guests and wants to pamper you too. Deborah will come to our bed and breakfast - set her table up in your suite or in a private area of the house near your suite for your massage. Deborah is licensed in Reflexology, Hot Stone and Swedish massage. She sets the mood for the massage with a heated table, soft lighting and soothing background music. Deborah will concentrate on particular areas for you or she will give you a full body massage. Couples - side by side massages are also available. It is best to schedule your massage in advance (7-10 days). 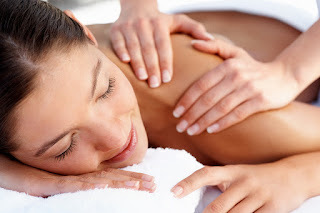 Massages can be scheduled for 1 hour at $70.00 or 1 1/2 hours at $100.00 per person. Gift certificates are available - please contact us by phone to schedule a massage or purchase a gift certificate. We hope you take advantage of the convenience of a massage during your stay - pamper yourself soon - you are so worth it.